I must have blinked, she's big and beautiful! Thanks for everyone for the nice comments. 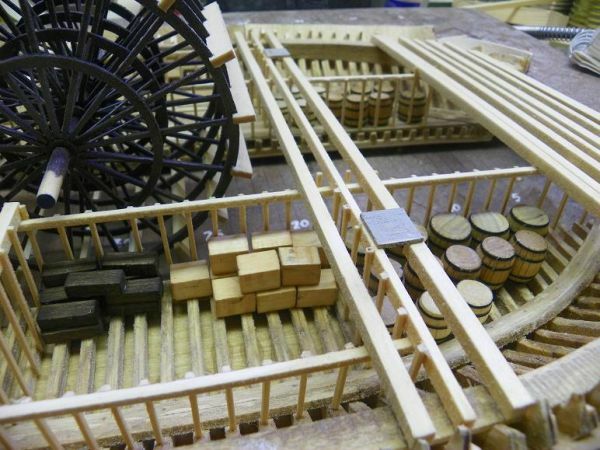 Mario, sorry for not showing more pictures of the details on building the paddlewheel. 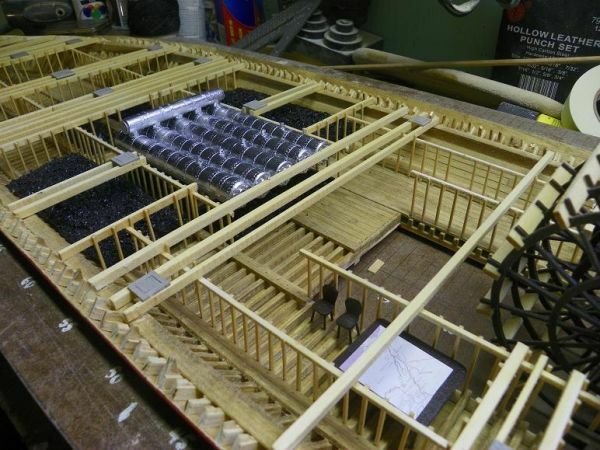 I've got many other very unusual items to build for the Cairo, and I'll show more details in future photos. The three rooms adjacent to the boiler hold are coal bunkers. 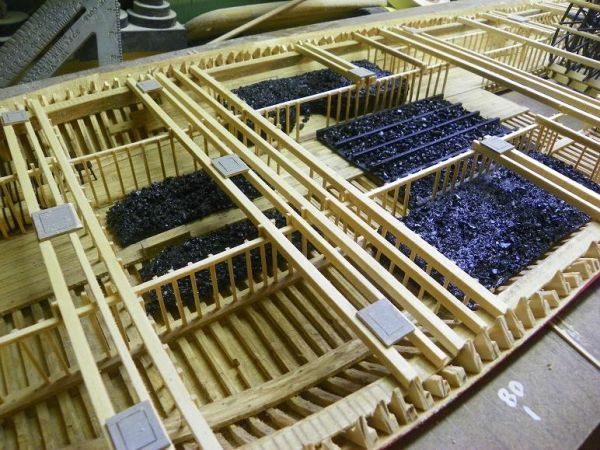 First, I trimmed pieces of wood to the approximate shape of the pile of coal in each of the bunkers. Next, I coated the tops and sides of each of the piles with a fairly ample quantity of Elmer’s Carpenter’s Glue. It’s okay if some of the glue drips heavily in some places. Then, I sprinkled crushed aquarium rocks all of the glue, covering it thoroughly. A little more glue and some more crushed rocks can be added where needed. Finally, after the glue dried, I spray painted the piles with black satin spray paint. After the paint dried, I glued each pile in its respective coal bunker. So far, I have added a table and two chairs. The tabletop and legs are made from basswood, which was painted with acrylic Burnt Umber. The chair backs and seats are cut from 1/16” basswood, and the legs are bamboo dowels. This, too, was painted with Burnt Umber. More items will be added later. I placed a map of the lower Mississippi River on the table. 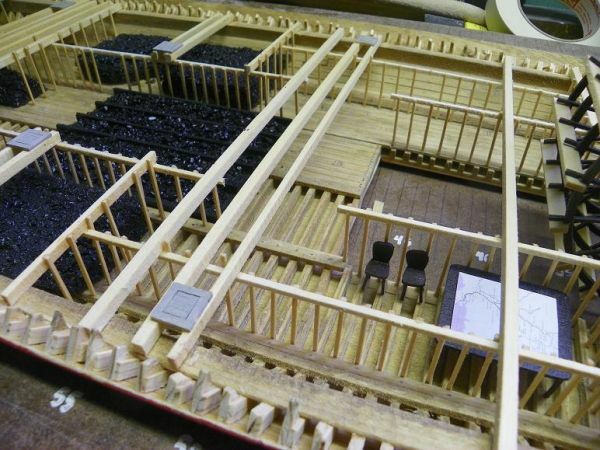 The two aftmost storage rooms contain barrels and ammunition crates, and perhaps other things will be added later. I turned three different-size dowels on a lathe to the shape of barrels, cutting them off at each segment. Then each barrel was inserted in a vise, and the staves were scribed with a razor saw, turning the barrel after every couple of staves. Then the barrels were given a coat of either Minwax Golden Pecan Stain or Minwax Fruitwood Stain. After the stain dried, I added four hoops to each barrel. The hoops are simply strips of think card painted black and glued around the barrels. The ammunition crates are two different-size blocks of basswood, with each size given a coat of Minwax Fruitwood Stain or Minwax Jacobean Stain. The basic structure consists of five ¾” x 6” dowels, two 5/16” x 4” dowels, and one ½” x 4” dowel. The edges of all dowels are slightly rounded. Everywhere rivets appear, I simulated them by perforating thin card with a pounce wheel, and then cutting them into thin strips and gluing them around the dowel. Both ends of the five main boilers contain many tiny details. The five circular pieces at each end are cut from a plastic straw and glued in place. The very tiny remaining pieces are either basswood or bamboo. Where nuts appear, I used bamboo. The smaller boilers located at the top and bottom of the five main boilers are attached to the main boilers with short lengths of ¼” dowels, with holes drilled into both boilers in each case. Once the assembly was built, I gave it a coat of Metallic Silver spray paint. 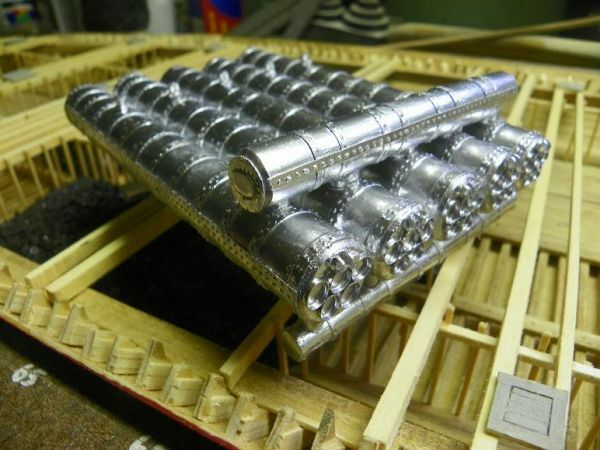 Finally, I glued the assembly in place above the coal hoppers. I agree with Mario she really looks great the boilers are cool and I like the way you simulated the coal. I would have tried to use real coal resulting in a very dirty model. LOL The chairs and table with the map on it is a nice touch also. It's amazing what you're able to create with a few simple items. I thought for sure the boiler was some complex assembly, possibly metal that was silver soldered. Very impressive Gene !! Clear and neat. Very nice indeed Gene, although Mikel has a point - the floor of your coal bunkers is too clean! Thanks very much for all your comments.